Building with Georgian exterior trim. These homes are commonly constructed of wood, brick and stone construction and feature very balanced symmetry. The Georgian house is usually a simple one- or two-story square box, one or two rooms deep, always with windows and doors equally balanced. 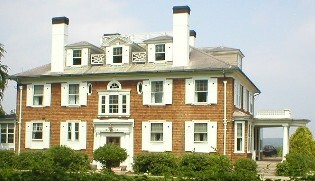 Georgian exterior trim on ornate front entrance, gables and dormers are common, as are pediments, quoins and dentil trim. The Exterior Georgian trim should be of a ‘solid, dignified’ feel. If your house is of the classic Georgian style, that is the English Georgian, it is brick. 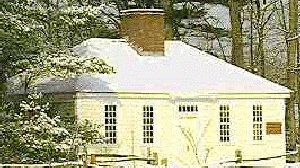 But the American Georgian or colonial Georgian also accepts stone, clapboard style siding, and even shingled siding can be stretched to be accepted in the overall theme. 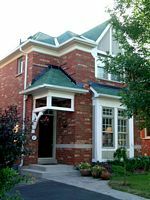 I believe the most important feature is the symmetrical structure of the house and main entrance on the down eave side of the home. Probably the most visual styling would be the windows. If you are replacing windows, try to rearrange them into symmetrical blocks. If that is not possible then probably the exterior trim can be designed to increase the feeling of symmetrical unity. The window style should be double hung style or divided lite, double hung. From a modern standpoint divided lites in the upper sash and solid pane below is acceptable. And don’t forget the shutters. The homes of the northern colonies were built to withstand the harsh climate. Shutters were important for environmental protection as well as safety and should be employed to authenticate a Georgian exterior trim. If it is possible to use working shutters all the better, but usually the false shutter is plenty acceptable. Use as expensive a shutter as you can afford. Wooden shutters are available in many styles and some have carvings in the panels. The use of shutter dogs creates a subtle, but significant honesty to period styling. If your home has vinyl siding, paint the corner trim contrasting to the overall color of the home. In many of the Georgian Colonial Revival homes two shades of green were employed. One on the shutters and one on the window frames. This combination helps distinguish the fine lines of the windows from the mass of the shutters. click to enlarge The entry door should be paneled. The exterior trim for the door should be a closed, fluted pilaster with blocks in the upper corners. Above the door could be a semi-circular fanlight or a lighted transom. If either of these options are not available us a decorative garland or carving to ‘lift’ the top of the entry. If the entry is elevated use steps that widen at the bottom with wrought-iron railings. A Flemish bond brickwork for steps or the step sill would be a nice touch.